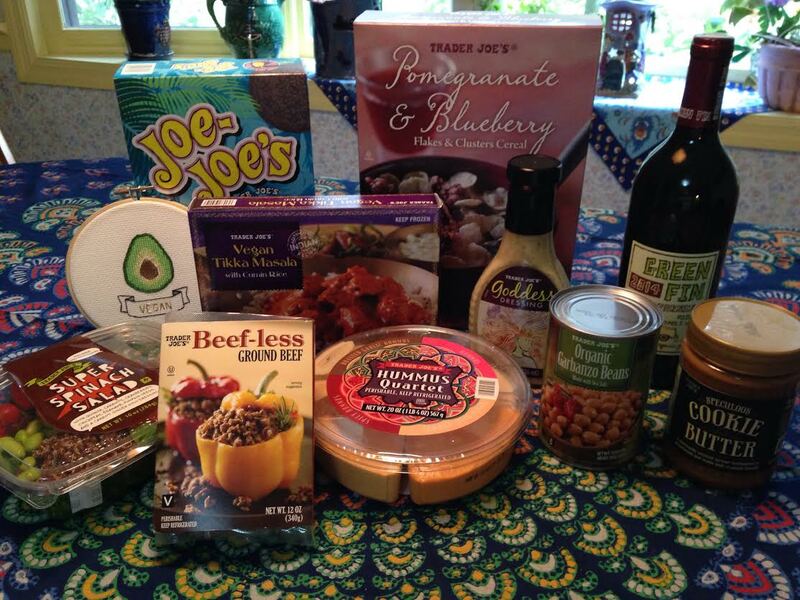 10 Trader Joe’s Favorites Every Vegan Should Try | Finding delight. I’m not going to lie, I’m one of those strange birds who loves to grocery shop. At the same time, I pretty much hate all other shopping. But give me a store full of food and I am salivating at the prospect of shopping for all of the goodies. I could literally go to the grocery store every day, and just about do. 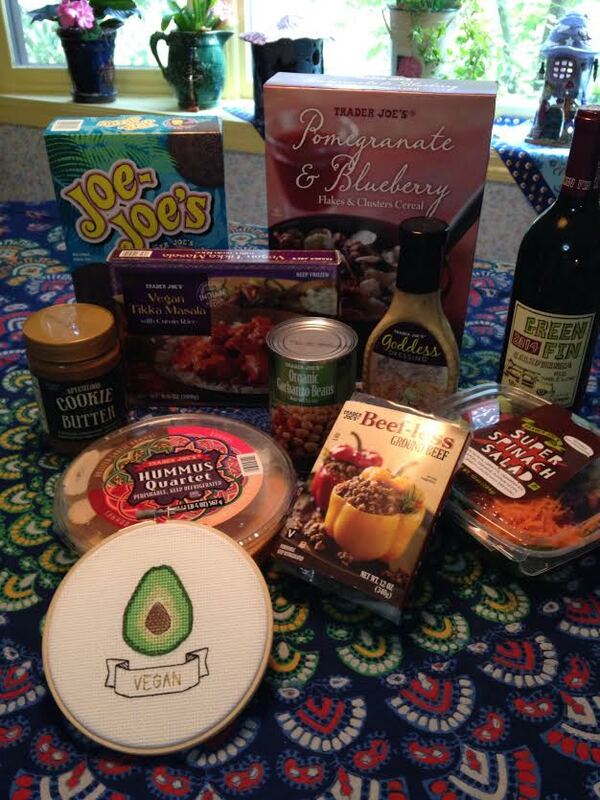 And so when Trader Joe’s opened a store in Lexington, KY, I was like a kid on Christmas morning. It didn’t take long for TJ’s to become one of my favorite stores and here is why. Every time I go, there’s a new adventure waiting. The thing that Trader Joe’s does really well is to provide lots of interesting, unique seasonal products while maintaining a great array of staple products that one always needs. And TJ’s knows how to market all these specialty products really well. The Fearless Flyer shows up in my mailbox, I study it like I’m preparing for the biggest exam of my life, I make a list of all the things I must try, and then off I go to the store. The most recent Fearless Flyer was titled “We have a thing for pumpkin” and, believe me, they do! Pumpkin tortilla chips, pumpkin spice granola, pumpkin bagels, pumpkin butter, pumpkin Joe-Joes (wondering what a Joe-Joe might be? Stay tuned for an explanation later in this post.) and, hey, even plain ol’ pumpkin. Yummo! And we won’t talk about how many boxes of Pumpkin Joe-Joes I bought, Shhh! #10) Green Fin California Red Table Wine. I generally like to match my wine to the season (thanks Beth for putting me onto seasonal wine drinking) but I like having this wine, made from organic grapes, on hand for whenever I feel the need for a nice glass of red that goes with pretty much anything. #9) Cookie Butter. I was introduced to cookie butter when my younger daughter, Katie, lived in Minnesota. This stuff is addictive, great on toast or whatever, and fills in nicely for dessert when no other dessert options are available. #8) Vegan Tikka Masala. I keep one of these in the freezer at all times. Then when I have one of those 10-hour work days and don’t feel like preparing food, I pop this bad boy in the microwave and voila! #7) Beef-less Ground Beef. A staple and, while there are a number of companies that produce soy crumbles, this one is particularly good. Ask me about the killer meat-less loaf I made last week. Meat-less loaf sammies for days! #6) Organic Garbanzo Beans. Another staple not to ever be without. Again, organic chickpeas are available everywhere but not for the price at TJ’s. 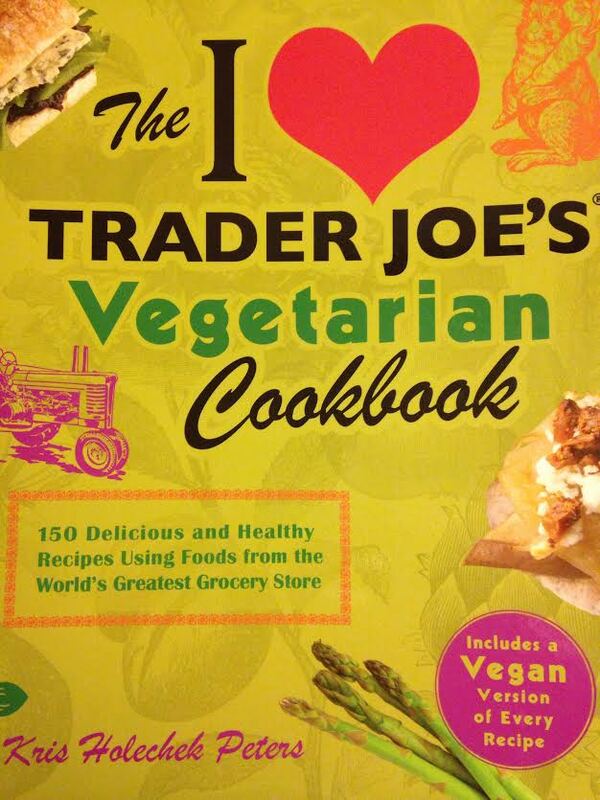 And check out The I Love Trader Joe’s Vegetarian Cookbook and make this BBQ Bowl. Delicious! #5) Super Spinach Salad. I just love this salad! And have it about once per week. Spinach, quinoa, carrots, dried cranberries, edamame, pumpkin seeds and a carrot ginger miso dressing. What’s not to love? 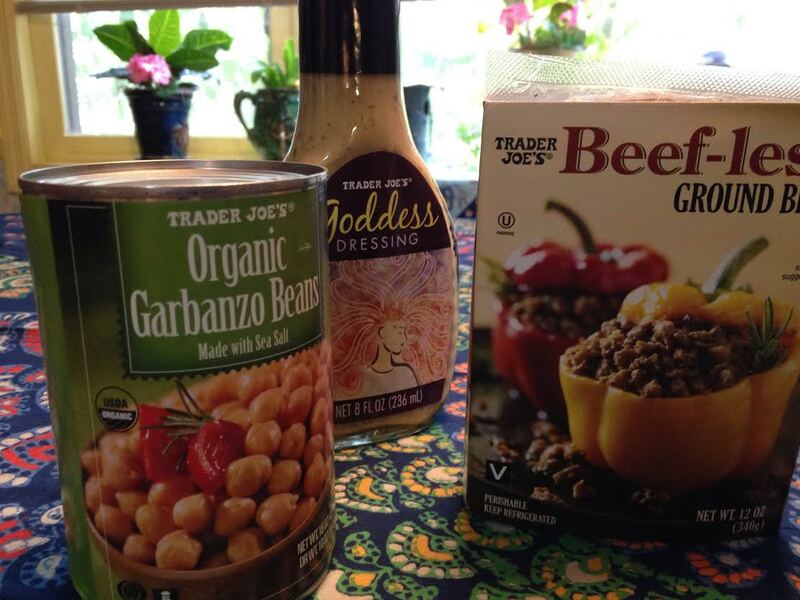 #4) Goddess Dressing. OMG! This is so good! Honestly, I make most of my own salads even though I succumb to the Super Spinach Salad from time to time. I even make my own dressings a lot of the time. But when I don’t make my own, this is my go-to dressing time and time again. #3) Hummus. No self-respecting vegan or vegetarian can be without hummus, right? I’m right. I ALWAYS have some on hand to pair with my pita chips, tortilla chips, veggies, etc. I love the TJ Quartet most of all because then I don’t have to decide which flavor to get. Heck, just get them all! #2) Cereal. I LOVE cereal but only for breakfast. I’m not one of those people who eats cereal for supper. However, I’m pretty particular about my breakfast cereal. It needs to be organic, there needs to be at least 2 kinds in the bowl (usually 3), there needs to be berries &/or banana slices on top and there needs to be cold soy milk poured over it (I’m definitely Team Soy for this delight). 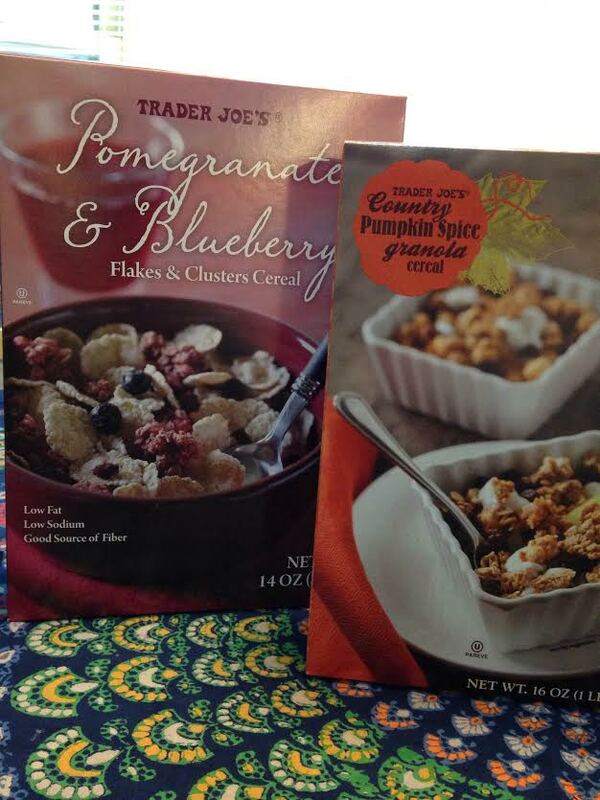 All that being said, I can’t name just one cereal that I purchase at Trader Joe’s. I almost always have 2 or 3 or 4 boxes at check out. But make no mistake, there will be cereal. #1) Drum roll, please! Joe-Joes. Think TJ’s take on an Oreo. I happen to like Joe-Joe’s better, though. These are my little chocolate sandwich cookie guilty pleasures. I don’t eat them every day or in large numbers – that wouldn’t be very healthy, now would it? – but when I need a chocolate fix, nothing satisfies quite like a Joe-Joe. The chocolate Joe-Joes are getting a little jealous here lately as I’ve been experiencing more pumpkin cravings and resorting to pumpkin Joe-Joes. Don’t worry chocolate Joe-Joes, you’ll always be my true love!! And there you have it. My Top 10 TJ Products. What are your top 10? 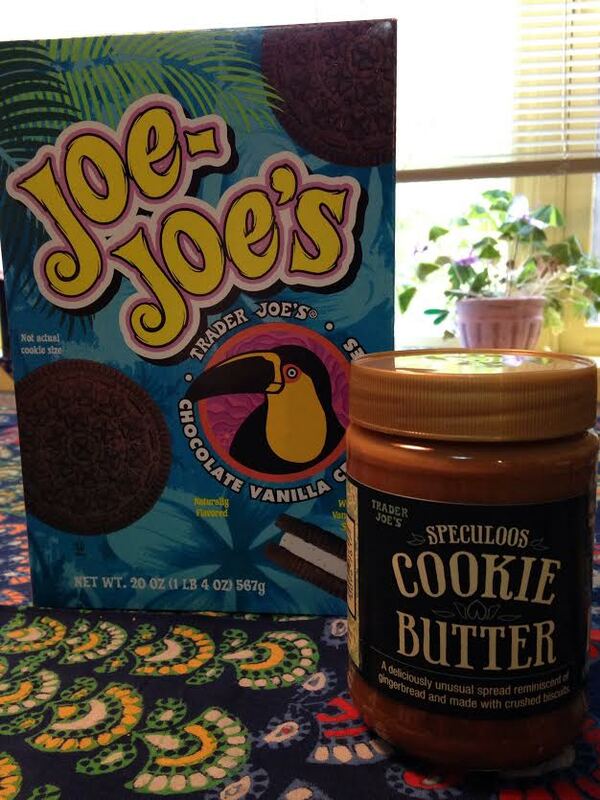 While you’re thinking about that I’m just going to make a quick run to my Trader Joe’s for some more yum-yums. Thanks, Beth, for the challenge. You know, I love a project – especially one that involves food! …if you’re looking for some TJ’s inspiration! P.P.S. The super adorable vegan avocado cross-stitch is from SickBeetStitch. Thanks for this, Pam. I’m anxious to try at least some of them. The Super Spinach Salad sounds delicious! 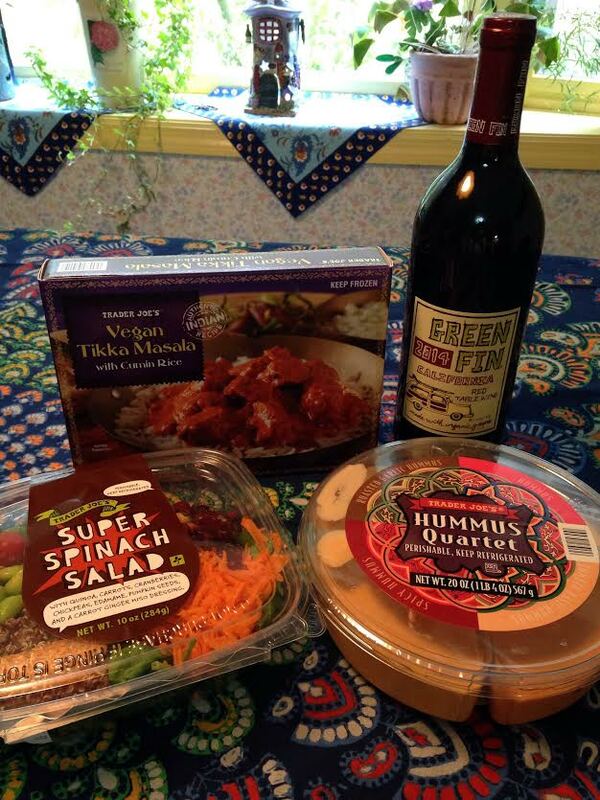 Pingback: Ballin’ on a Budget–Ditch the Bare Cupboards & Empty Refrigerator | Finding delight. Pingback: Meatless Cooking with Quorn | Finding delight.